SCVHistory.com HS7010 | Newhall | Pioneer Oil Refinery & Pico Derrick Float, 1939 Pasadena Rose Parade. 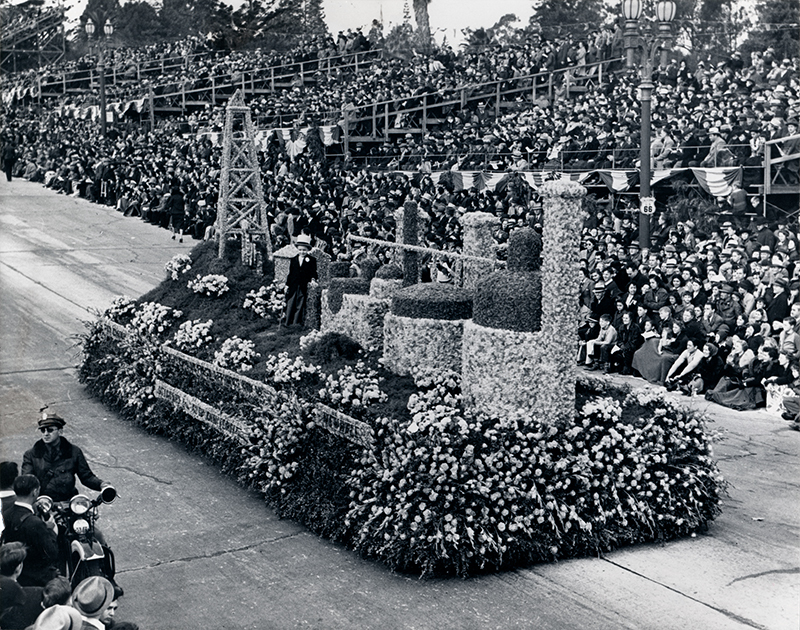 January 2, 1939 — A floral facsimile of Newhall's Pioneer Oil Refinery floats down Colorado Boulevard (Route 66) and into Rose Parade history as the grand prize winner of the 50th annual Pasadena Tournament of Roses Parade. Detail from ~1880 photo showing tail house. Click to enlarge. The float features all four of the refinery's boilers and all three smokestacks (the fourth boiler, historically the first, is behind the boy) — all of which were still present in real life. Also seen is a replica of the No. 4 derrick from the Pico oil field, which in reality would be about 6 miles away. Between the refinery and the derrick (also behind the boy) is a small feature that might be the tail house or receiving house, which stood next to the boilers. Historian Stan Walker describes it as a structure where all of the liquid from the condenser pipes was collected, inspected and directed to the holding tank. The oil well and reinfery represented here were the first commerically successful ones in the American West. Evidently the float had moving parts; see description below. 8x10 glossy print, probably a copy print, sourced to Chevron USA (aka Standard Oil Co. of California). The parade was held January 2 because January 1 fell on a Sunday. Actress Shirley Temple was the grand marshal in 1939, a role she would reprise in 1989 and 1999. Later in the day, No. 7 USC upset No. 3 Duke in the Rose Bowl game, 7-3 [cq]. Los Angeles Times | January 3, 1939. Grand prize in the parade went to the Standard Oil Co.'s entry, "Romance of the Oil Industry." This floral masterpiece depicted the drilling of the first oil well in California 60 years ago. One of the larger commercial entries, the Standard Oil float, showed in all the multicolored brilliance of countless buds the history of oil development in the State. An oil-well derrick, a floral delight in blue delphiniums, pumped away with a boom pump of brown pompons and purple statices. 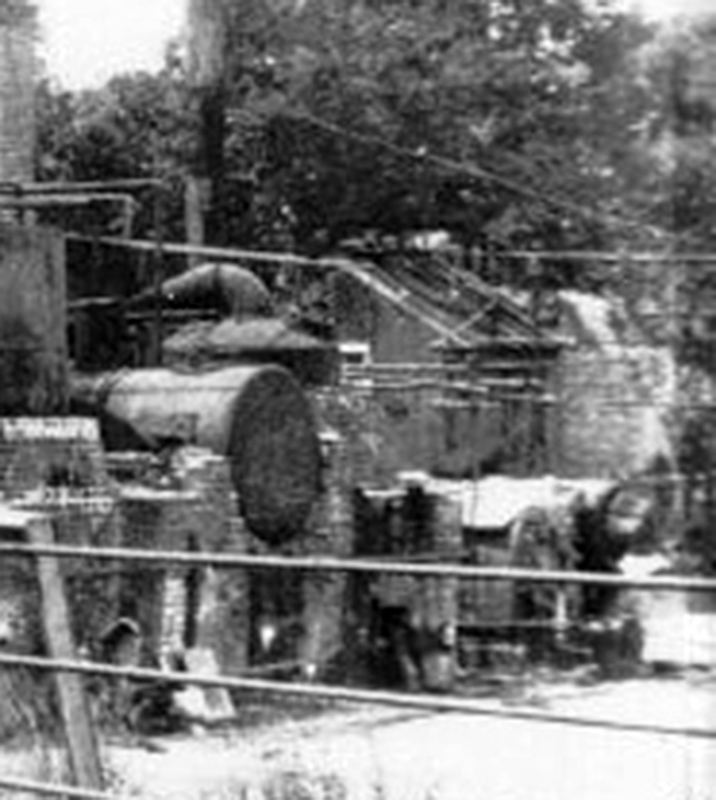 Near by were three refining units and boilers [sic: 4 are visible], all strikingly constructed from yellow chrysanthemums and blue cornflowers. Running from one miniature unit to the other and supposedly carrying to and from the black gold of California, flower-decked conduit pipes of delphiniums caught the eye. Upon the base of the float, faced with greenery and sweet peas, were 3,000 talisman and 500 yellow roses. Submitted by Fred Campagne, 937 Bellflower Blvd., Bellflower, Calif.
Sioux Center (Iowa) News | Thursday, January 26, 1939. 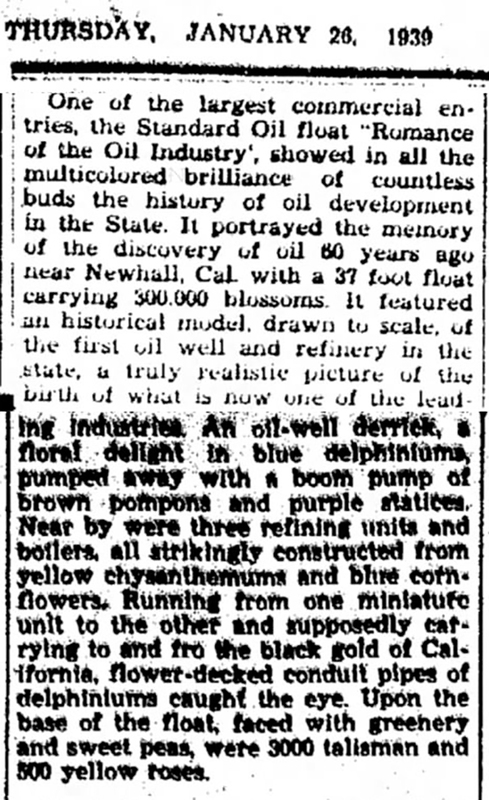 One of the largest commercial entries, the Standard Oil float "Romance of the Oil Industry," showed in all the multicolored brilliance of countless buds the history of oil development in the State. It portrayed the memory of the discovery of oil 60 years ago near Newhall, Cal., with a 37-foot float carrying 300,000 blossoms. It featured an historical model, drawn to scale, of the first oil well and refinery in the state, a truly realistic picture of the birth of what is now one of the leading industries. An oil-well derrick, a floral delight in blue delphiniums, pumped away with a boom pump of brown pompons and purple statices. Near by were three [sic: copied from the Times] refining units and boilers, all strikingly constructed from yellow chrysanthemums and blue cornflowers. 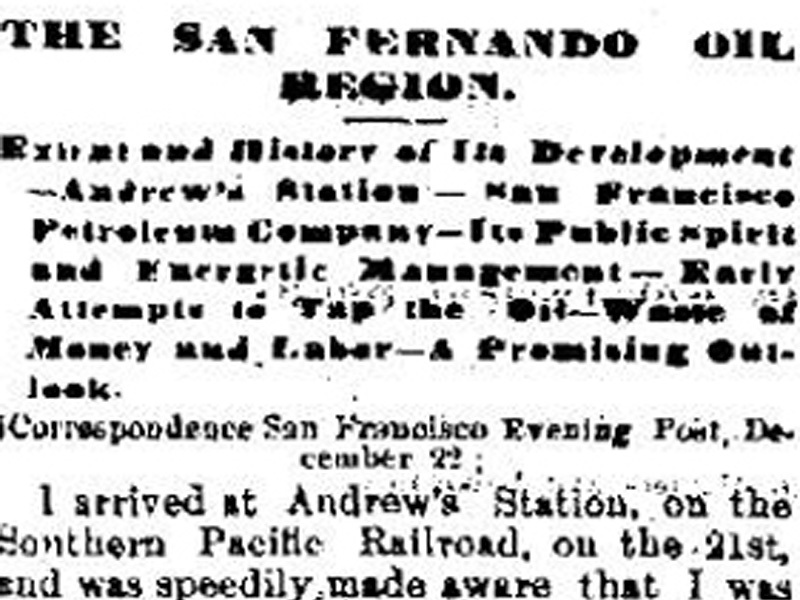 Running from one miniature unit to the other and supposedly carrying to and fro the black gold of California, flower-decked conduit pipes of delphiniums caught the eye. Upon the base of the float, faced with greenery and sweet peas, were 3,000 talisman and 500 yellow roses. HS7010: 9600 dpi jpeg from original photograph (copy print? ), Santa Clarita Valley Historical Society collection.